Hey all! I am Valerie and April 24 is my 25th birthday. 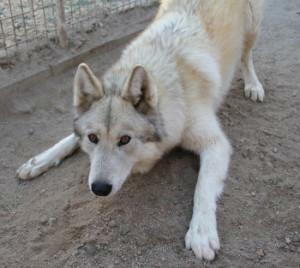 Because of the amazing experience I had at Wolf Connection, I would like to use my birthday to sponsor an amazing wolf-dog named Max. Wolf Connection not only rescues wolves and wolf-dogs (which would be automatically put on death row at a pound), but they also train these intuitive, and sensitive animals to be of service to at-risk youth, children in foster care, gang members, and persons undergoing alcohol and drug rehabilitation. Max was a gift from a father to his nineteen year old son who had begged for a wolf dog. Unfortunately, the family was not prepared for the amount of training and attention required. Max is very shy, skittish and intelligent…..Without enough attention, he did some creative landscaping of the yard and remodeled the back wall of the house. After jumping through a glass window to get inside the house, the owners reached out to Wolf Connection for assistance. Max became a pack member and the son became a volunteer! Max continues to work through his shy personality while continuing to be his playful, mischievous self.